There are many different birds that love shores: gulls, ducks, pelicans, sparrows, geese, and terns are all popular beach birds to see. Even vultures, eagles, and other raptors as well as the occasional heron, egret, and swallow may be found in beach and shoreline habitats. When birders use the term shorebirds, however, they are referring to specific types of birds with distinct body shapes and behaviors. There are several types of shorebirds that can occupy beaches, estuaries, marshes, and other shores. Understanding the subtle differences between each type can help you learn to identify shorebirds more easily. Shorebirds come in many shapes and sizes, but all of them share certain physical and behavioral traits. Nearly all shorebirds have a distinct preference for wet habitats and shorelines, both on coasts as well as along inland waterways, marshes, or general riparian habitats. Most shorebirds are carnivorous and eat a range of insects, mollusks, crustaceans, worms, larvae, tadpoles, and similar prey. Physically, these birds have round heads, generally longer legs, and very useful bills to probe for food in the sand, mud, gravel, and water. Many shorebirds are gregarious, and mixed flocks that include several different types of beach birds are common. During the breeding season, these birds are often shy and will engage in dramatic distraction displays to protect their ground-level nests and chicks. The term shorebird covers several related bird families that are part of this distinct group, and more than 180 species could be considered true shorebirds around the world. Avocets are relatively large wading shorebirds with small heads, very thin, sharply upturned bills, and exceptionally long, thin legs. There are only four species of avocet, and because there are so few, they are often target birds for birders who travel extensively. The black-and-white pied avocet is found in Africa, Europe, and Asia, the red-necked avocet is found in Australia, and the white-headed Andean avocet is found in South America. The American avocet is the only one found in North America, making it easily recognizable, especially in its colorful cinnamon-tinged breeding plumage. All avocets are part of the Recurvirostridae bird family which also includes the stilts. These two types of shorebirds are often seen together, even in breeding areas. Jacanas are tropical shorebirds with long, thin legs and very long, very thin toes and talons. Those exaggerated toes help these birds walk on top of lily pads and other vegetation in tropical marshes so they can forage over deeper waters without sinking. Because these are tropical birds, their plumage is generally more colorful and has warmer tones than most shorebirds. Some jacanas even have red, yellow, or orange markings or colorful skin patches. There are only eight jacana species in the world, and they all belong to the family Jacanidae. According to some classifications, jacanas may be considered more closely related to wading birds than shorebirds, but they can be grouped either way. Oystercatchers are generally stocky, shorter shorebirds with long, thick, straight bills strong enough to pry oysters, clams, and mussels free from slippery rocks and crack these delicacies open. 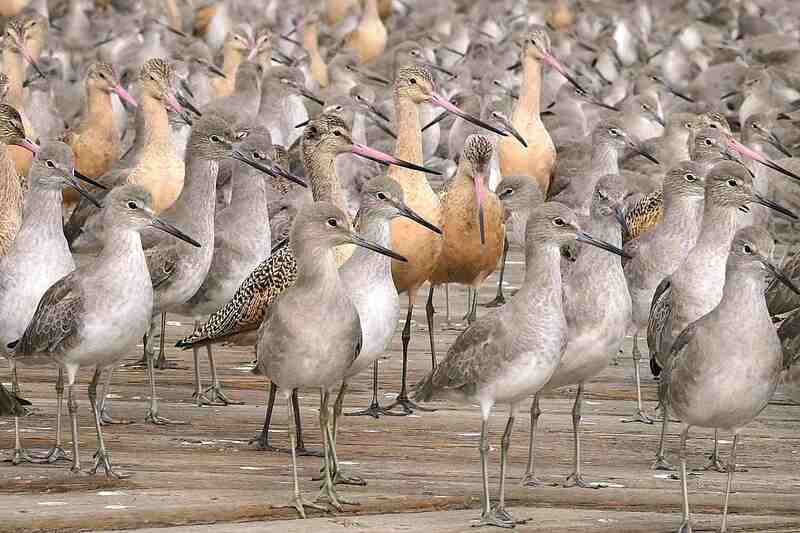 These birds have relatively plump bodies, and their legs are thicker than most other shorebirds. The dark plumage of most oystercatcher species is very similar and the best way to identify these birds is by geography, since many of them have limited ranges that do not overlap. All oystercatchers are part of the Haematopodidae bird family and there are 10-12 total species throughout the world, depending on how individual species are split or lumped with their subspecies. The plovers are a diverse group of smaller shorebirds with compact builds, short, thick necks, relatively short legs, and small, straight, thicker bills. Many plovers have distinct bands on their head or breast and may also show distinct wing patterns in flight. Their nervous behavior of short sprints, abrupt stops, and glancing around as they stay above the waterline foraging for insects is a strong clue to their identity. Some plovers, such as the killdeer, however, can be found far from water, but still share physical and behavioral characteristics with their other plover relatives. All plovers, approximately 65 species worldwide including lapwings and dotterels, belong to the Charadriidae bird family. The most diverse category of shorebirds is the sandpipers. Sizes and colorations range greatly from tiny, bland birds to much larger, distinctly marked species. All of these birds have sensitive bills they use to probe through the sand or dirt when feeding, and they often eat insects, worms, mollusks, and similar prey. While there are many species that include “sandpiper” in their name, other species such as turnstones, stints, godwits, curlews, woodcocks, phalaropes, yellowlegs, snipes, and dowitchers are also classified as sandpipers. All these birds are part of the Scolopacidae bird family, which includes 80-90 different species. Aptly named, the stilts are tall shorebirds with long, thin legs that resemble gangly stilts. These birds can be identified by their long, straight, thin bills and bold markings, including the colorful legs of some species. They have very high-pitched, squeaky voices. There are only three stilt species in the world, and each is distinct. The black-necked stilt which is found worldwide, the banded stilt is in Australia, and the black stilt, which is critically endangered, is only found in New Zealand. All of them are included in the Recurvirostridae bird family with their avocet relatives, and like the avocets, are often target birds for visiting birders.